I really love when models play with light and shadow in interesting ways. It can create some very dynamic compositions, even on a model as static as this. The transitions from light to dark are not only pretty stark, but the color of the light is even played with. By making the "night" side of the model a blueish green they evoke the main color of the Shadespire box, really helping set the model in the ruined city. 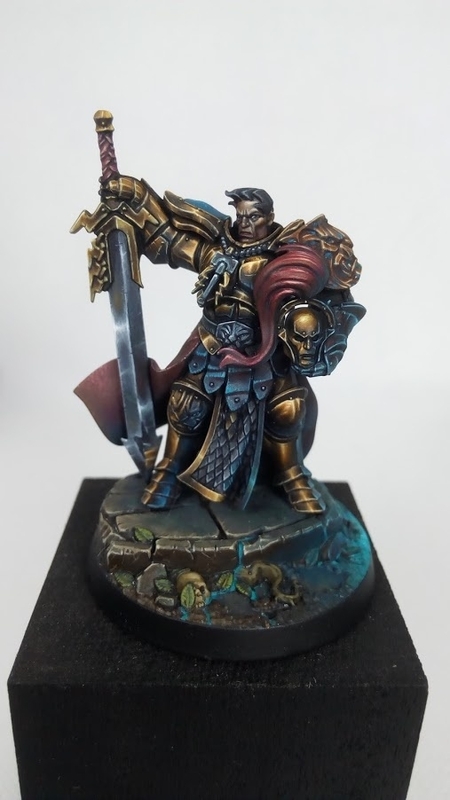 This would be challenging on any model, but especially so on a model in mostly metallic armor, and even more so when painting it as non-metallic metal! The gold on this is great, and just like the lighting, goes from a fairly bright highlight, to a very dark shadow in a short time. Despite this, everything is smooth and crisp. There are even some painted on reflections, like his foot on the sword. 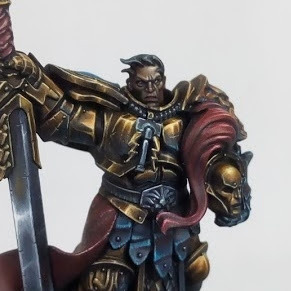 The face on this model is very well done as well, using slightly desaturated colors to give it more of a sense of realism. I don't think there is anything I would change on this mini, all around it's very well done. They've painted the other two members of the warband in a similar manner, which you can find on Putty and Paint, and they look just as good.